DataVault for BlackBerry can synchronize items, categories and types with DataVault for Windows and DataVault for Mac desktops. If you have modified the same item on your handheld and desktop since the previous synchronization, DataVault provides methods to select the version you want to keep. Troubleshooting tips can be found on the Frequently Asked Questions (FAQ) page. DataVault for BlackBerry can be synchronized with DataVault for Windows using a data cable or wirelessly. 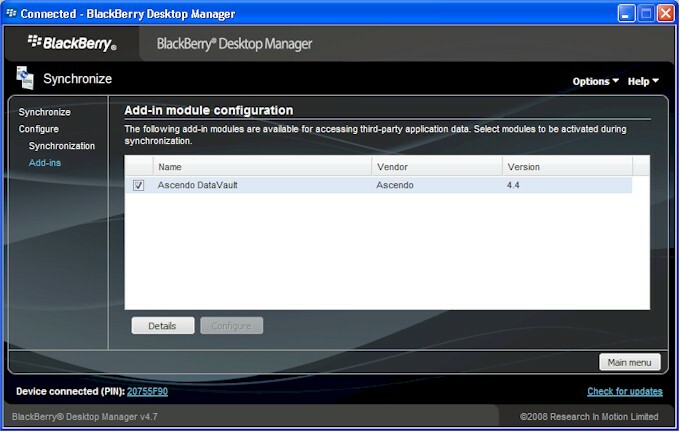 When installing DataVault for Windows, an "Add-in" for BlackBerry Desktop Manager will be installed simultaneously. The DataVault Add-in manages the synchronization process. To verify that the Add-in was installed correctly, start the BlackBerry Desktop Manager, select Synchronize then click on Add-ins, see figure below. If you don't see "Ascendo DataVault" in the list of Add-ins, quit BlackBerry Desktop Manager, reinstall DataVault for Windows and look again. Make sure that the Ascendo DataVault Add-in has been activated by clicking on the checkbox to the right of the Name column. 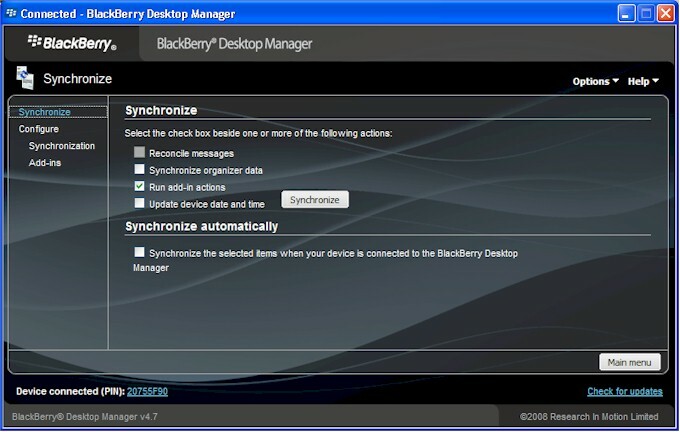 When the Ascendo DataVault Add-In is installed and correctly configured, go back to the BlackBerry Desktop Manager Synchronize screen and click on the Synchronize, see figure below. Check off "Run add-in actions" then click on the Synchronize button. For security reasons, you will be prompted for your master password. If you modified the same item, category or type on your handheld and desktop, you will be prompted to resolve the conflict. Important: Please make sure that you are running all programs: Blackberry Desktop Manager, Ascendo DataVault Desktop installer (DataVaultSetup.exe file), and Ascendo DataVault Desktop as Administrator of the computer. Wireless synchronization with DataVault for Windows can be implemented over a Wi-Fi network, Direct TCP Connect, BES Connect or WAP (Auto Detect). To synchronize wirelessly, start DataVault for Windows and select File > Synchronize from the menu bar. Then start DataVault for BlackBerry and select Advanced from the main menu. Click on Connection Settings, choose from the list of options, then enter your desktop IP Address and click on Connect. DataVault for BlackBerry can be synchronized with DataVault for Mac over a direct wireless connection or using email. Not all BlackBerries have are equipped with Wi-Fi adapters so be sure to check the specification of your model before trying. To synchronize over a direct wireless connection, start DataVault for Mac and select File > Wireless Synchronization from the menu bar. Then start DataVault for BlackBerry and select Advanced from the main menu. Click on Connection Settings and select Wi-Fi. Now enter the IP Address and click on Connect. When synchronization is completed DataVault for Mac will prompt you to Send an email back to your BlackBerry to complete the synchronization process. Enter your BlackBerry email address and send the email back to a handheld. Open the email on Blackberry, then open the attached DVX file. This operation will complete the synchronization process by adding the appropriate desktop modifications to your BlackBerry. There may be instances where you modify an Item on your BlackBerry and then modify the same Item on your Desktop with a different value. If conflicts occur, you will be alerted and asked to choose if you want to save the Item as it is stored on you BlackBerry or your Desktop. You can choose to always have the BlackBerry edits overwrite the Desktop items or vice versa by selecting BlackBerry Wins or Desktop Wins from the Options window.